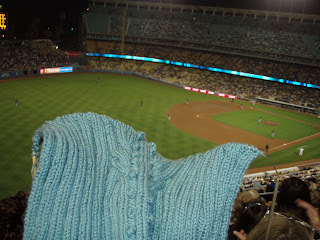 Knitting at a baseball game is difficult but is certainly worth a try!! I went to the Stitch and Pitch event at Dodgers Stadium with my friend Debbie on Tuesday May 22, 2007 - it was awesome - check out the Stitch and Pitch website here and you'll find the information about the program and if it's going on in your area - it's where all types of fibercrafting folks get together and go knit at a baseball game! 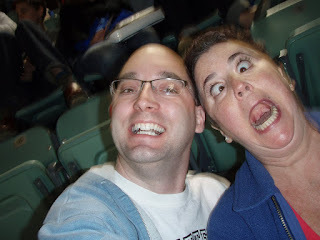 we were WAYYYYY up in the boonies but it was a great time - had a dodger dog, some nachos and I actually got some knitting done although not much knitting because all the neat folks there were just too distracting - It was neat to hear from the ladies around me - how two of them joined forces together to grow each other's yarn stash - the husband of one lady said she can't have any more yarn, so now she stores her recent stashes at her friend's house! - I thought that was hilarious! I also got a flyer about a contest at the LA County Fair for men knitters - called "Real Men are Knitting" - and while I don't know if I'll enter, I'm sure that I'll attend - (at least I want to) - I guess that while I think I'm pretty good for a beginner, I don't know how I feel about being judged... I'll have to look through my finished objects to see if I have anything worth entering and see what happens. We're off to Palm Springs this weekend (Memorial Day) to visit with family - it'll be a nice weekend getaway. I hope everyone stays SAFE and has a good relaxing weekend. My favorite part of trips like this: the drive (knitting time) of course! Youguys had a really fun night!!! Check out my blog to listen! I tried to email you the music a couple of times, but it didn't go through. Have you got another email address?